An important challenge for climate science is to understand the regional circulation and rainfall response to global warming. Unfortunately, the climate models used to project future changes struggle to represent present-day rainfall and circulation, especially at a regional scale. This is the case in southern Africa, where models from phase 5 of the Coupled Model Intercomparison Project (CMIP5) overestimate summer rainfall by as much as 300% compared to observations and tend to underestimate rainfall in Madagascar and the southwest Indian Ocean. In this paper, we explore the climate processes associated with the rainfall bias, with the aim of assessing the reliability of the CMIP5 ensemble and highlighting important areas for model development. 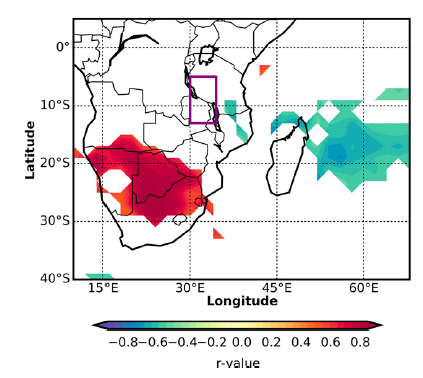 We find that the high precipitation rates in models that are wet over southern Africa are associated with an anomalous northeasterly moisture transport (;10–30 g kg21 s21) that penetrates across the high topography of Tanzania and Malawi and into subtropical southern Africa. This transport occurs in preference to a southeasterly recurvature toward Madagascar that is seen in drier models and reanalysis data. We demonstrate that topographically related model biases in low-level flow are important for explaining the intermodel spread in rainfall; wetter models have a reduced tendency to block the oncoming northeasterly flow compared to dry models. The differences in low-level flow among models are related to upstream wind speed and model representation of topography, both of which should be foci for model development.